So once the holidays are over and all your fabulous tech under the tree has been opened, appreciated and is getting good use, the rechargeable batteries are all going to start to get tired. And if your family is anything like ours, there are so many devices to charge that a stand-off ensues for who gets to use the outlets in the living room. 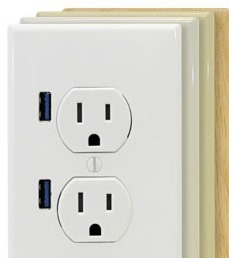 Did you know that you can upgrade your outlets to include USB ports!?! I KNOW! How I wish I'd known about FastMac U-Sockets before we'd painted. Why? These are larger than standard outlets, so they require a bit of carving to make 'em fit.